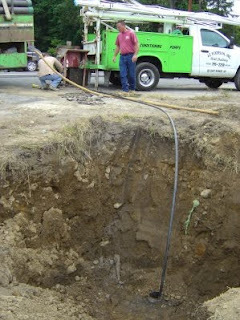 As part of our septic system project we have to abandon our old well. 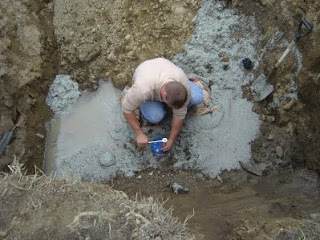 Essentially what you do is stick a long hose or tube down the well, and fill it with a clay-water-and-maybe-a-few-other-things mixture, which then becomes really thick and impenetrable. Then you put a nice blue cap (different colors are available upon request, though I was told purple is sold out until next year) on it to make it tight, and that's it. There was more digging and pushing dirt around going on today, but nothing spectacular. The big day is Friday. That's when we get the tanks, weather permitting. I might have to shoot some videos when they're installed. In case you were wondering what E! 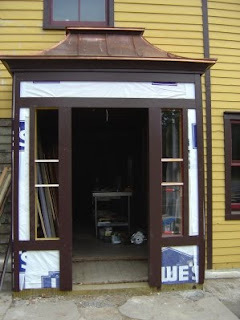 does these days, well, she is busy refurbishing the main entrance door, stripping off the old paint, filling in holes, and eventually repainting it, in cottage red. The main entrance itself is coming along as well. 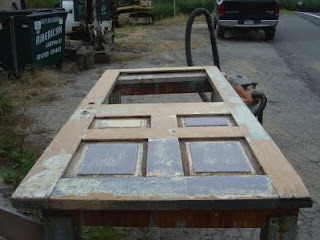 I installed the glass in the right window, and installed the left window frame. Soon it will sparkle again.